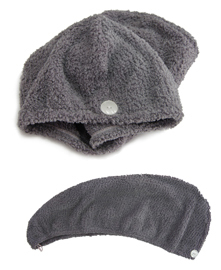 The magical, extremely soft shower cap instantaneously absorbs any water and residual shampoo left on the hair after washing. This saves time spent on blow drying, lessening any damage to overheated hair follicles. Keep shower caps drye. Care for your shower caps by drying them after each use. Wash your shower caps periodically with regular pH neutral detergents. This will help you preserve the life of your shower caps.